Announcement FREE SHIPPING! Eco-Friendly, Reusable, Folding, Cold/Hot Beverage Insulator...The Pocket Huggie! NOT your traditional Koozie, NOT NEOPRENE or FOAM. 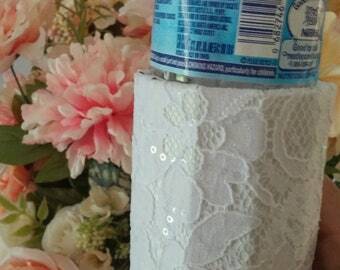 No more wet drippy napkins around your drink! The unique patented design provides not only insulation but added support to flimsy cups, cans and bottles. The corrugated, packing-grade cardboard interior stays dry because of the layer of air between the beverage container and the structural "fingers" of the Pocket Huggie. Your drink doesn't condensate and the Pocket Huggie keeps working over and over again!!! You must try the Pocket Huggie, it is so durable it's simply AMAZING!!! 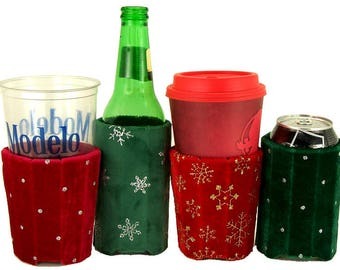 Also GREAT for hot coffee cups, saves in 50-100 plus coffee sleeves and keeps your drink hot or cold! Works like MAGIC! The Pocket Huggie comes in fully printed designs as well as fabric and faux fur designs. Please check out our wonderful variety to match YOUR style or event! FREE SHIPPING! Eco-Friendly, Reusable, Folding, Cold/Hot Beverage Insulator...The Pocket Huggie! NOT your traditional Koozie, NOT NEOPRENE or FOAM. Ordered two last year after the Christmas season so used them for the first time this season - loved them and they were a hit with our guests - had to order more. So cute! Show off your Personality with a Pocket Huggie! The Perfect Wedding Favor...the Pocket Huggie! Great Eco-Friendly Beverage Insulator...the Pocket Huggie! Reusable, Eco-friendly, Beverage Insulator for Cold & Hot Drinks for Cups, Cans and Bottles...the Pocket Huggie! Started by simply trying to reinvent the wheel. Our background in industrial design helped to create a wonderful, fun and functional product. Made from a packing grade corrugated board base, we make a variety of Pocket Huggies with full photographic quality printing or with fabric/faux fur. The Pocket Huggie simply works by suspending your beverage with a thin layer of air...air is the best insulator! Beverage keeps from sweating so the inside of the Pocket Huggie stays dry. It also gives additional support to flimsy beverage containers. Once you use our Pocket Huggie, you'll never be satisfied with the other kind of insulators. Comes in 3 sizes for Hot/Cold Cups i.e. Starbucks, Solo Cups, Stadium Cups and Pilsner glasses. Also Can Size and Glass Beer Bottle Size. Folds flat for easy portability. They come in a large variety for any occasion or season. We have a Pocket Huggie for everyone! Along with my husband Bob we have developed a unique, eco-friendly and innovative product called the Pocket Huggie! We hold the Utility Patent for this product.